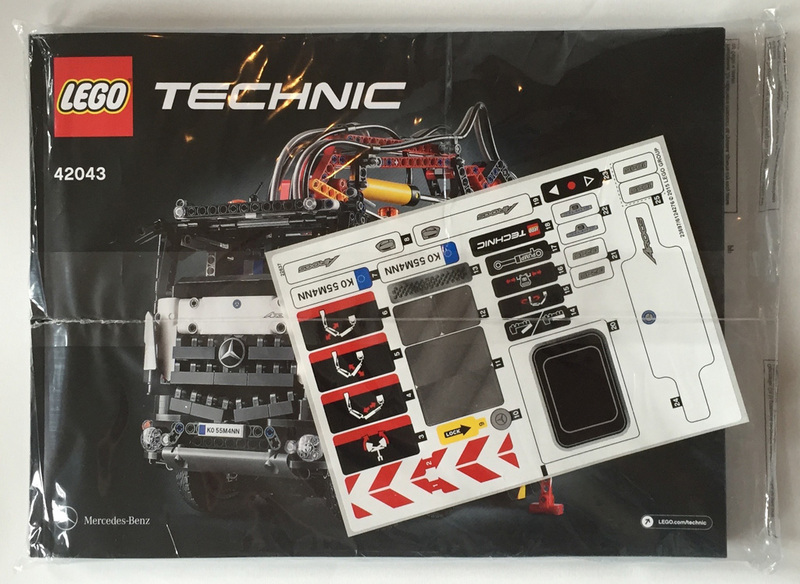 2015 has been a pretty exciting year when it comes to the Technic line-up - one of the best ever. It also marks not only an even bigger set than 42009, but also a second collaboration with Mercedes Benz. 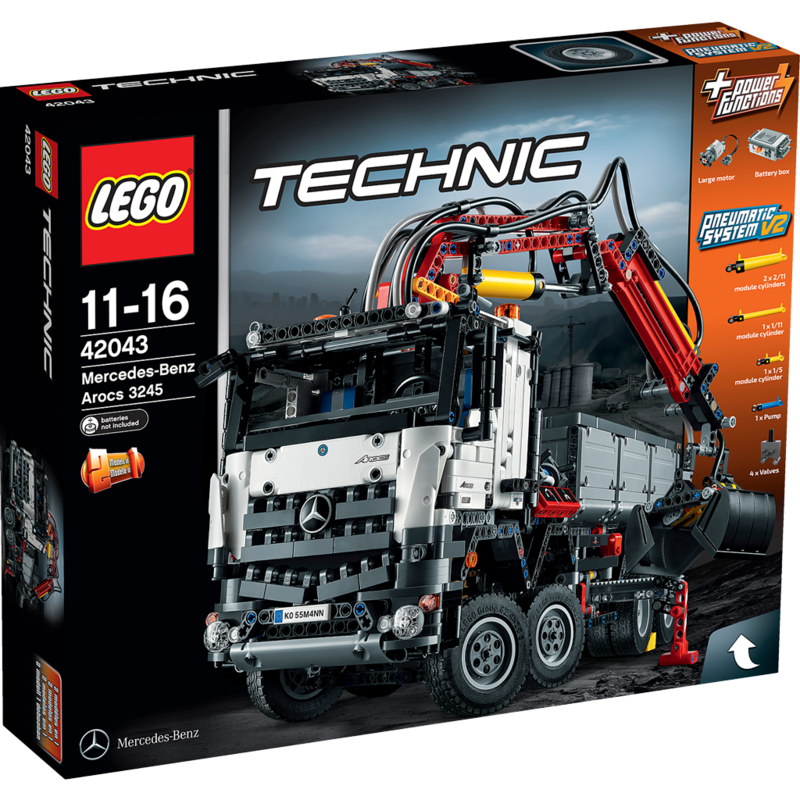 Now, I am not a real connoisseur when it comes to trucks or even plain cars (hey, I don’t even know how to drive either), but even a quick look at Technic set 42043 Mercedes-Benz Arocs 3245 proves that this is an outstanding set that fulfils all the dreams of avid Technic fans. 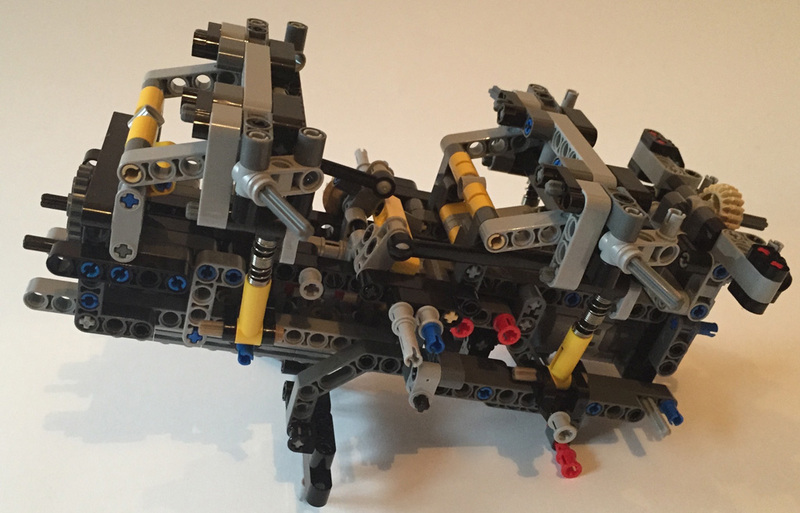 It is one of the most aesthetically pleasing Technic models imaginable, has a minimum amount of stickers (this review proves it looks even good without decals), full suspension on all wheels and a real wish come true: new and longer pneumatic cylinders. It is a set with some small flaws, but these are easily clouded by the sheer awesomeness of the build and the truck as a whole and for a huge licensed set it is very decently priced (GBP 169.99, EUR 199.99, USD 229.99). Let’s take a closer look at the building process and the amazing new parts it offers. The Technic flagship sets are the only sets I know to have boxes with a big flap to reveal all the cool functions. 42043 is not only extremely heavy when fully packed (over eight kilos to be precise), it also marks the first flapped box that can actually be flattened. My house is filled with boxes I cannot flatten, and since I refuse to throw these away, it fits in what little space I have. I welcome the decision to make this box flat-foldable. It’s a first and hopefully it is here to stay. Inside are a tightly sealed instruction book (a hefty volume of over 480 pages!) accompanied by a comparatively modest sticker sheet. 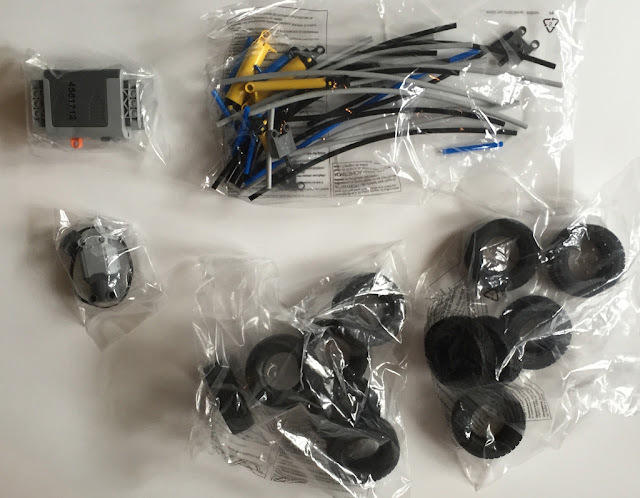 There are five general bags, two containing this set’s Power Functions (a battery box and an L Motor to be more precise), two bags with a total number of twelve tyres and a bag full of pneumatic hoses, valves, cylinders and a pump. 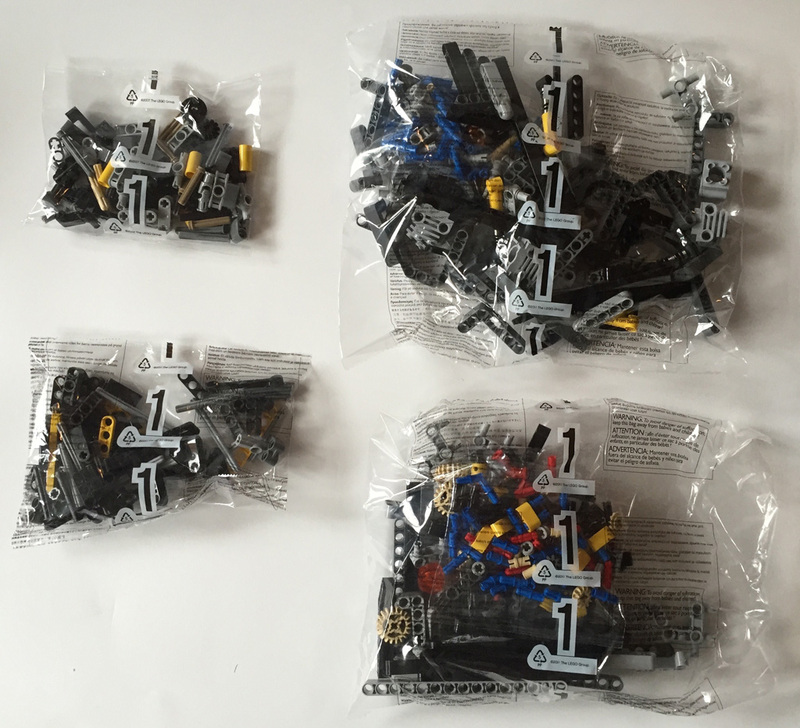 The set is divided into six stages with numbered bags. Even though some may be of the opinion this takes out the fun of a big build like this, to me it kept things a bit more organised. So we will take a closer look at the innovative building sequence and the new parts in six steps. One: Why Don’t We Get Things Started? Personally, I believe building a set’s chassis is the most fun of all. I like the early stages of a model where you have absolutely no idea what you are concocting or where things eventually end up. Generally the Arocs' impressive chassis consists of three stages: the front that is built with bags marked one, the centre containing the gearbox from bags numbered two and the back, consisting of the back axles as well as two differentials, whose parts are in the bags numbered three. Then these three parts are joined by long liftarms and pins, which always make for very satisfying steps. There are a total number of four bags numbered one. These bags don’t contain any new elements. Like with set 42040 Fire Plane we build the fake motor set-up in the first stages of the model. There is not much variety in these engines, so let’s just move on. Below the inline engine runs an axle that will eventually make the six yellow pistons move, making use of a rather remarkable rotation increase by using several gears. By far the most awe-inspiring feature of this stage is the build of the two steering axles. It makes use of an intricate combination of pins and the Steering Arm 5 x 1 with Towball Socket (Design ID 15459) introduced last year. These front axles can freely swing but are restricted by the use of these Steering Arms and the four sturdy yellow Shock Absorbers (Element ID 6027566). 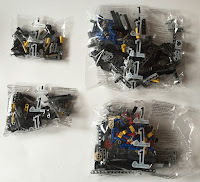 Also, the steering is generated by two links with different lengths, respectively a Technic Link 1 x 9 (Design ID 32293 and Technic Link 1 x 6 (Design ID 32005). These links, combined with the difference in length of the steering rods they control, cause the two axles to steer at a slightly different angle. Clever! The steering mechanism is linked to an upward-moving axle mounted to one side of the chassis. With the use of gears this is taken all the way to the top to the two emergency lights on the cabin’s roof. 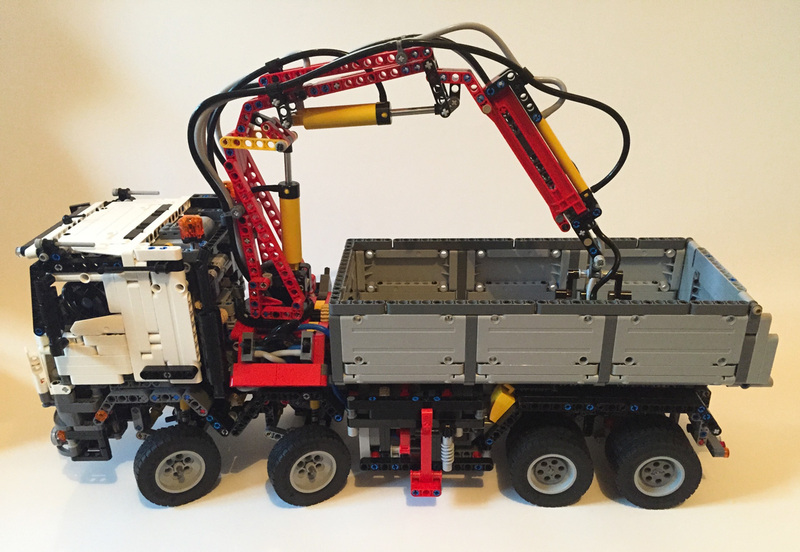 Even though the build of the two axles is very similar (as in: almost exactly the same), the whole front assembly of this truck is a true joy to build and a marvel of engineering, making smart use of parts available, enabling several moving parts to work either closely together or independently in a rather confined space. Building the front part is an amazing experience and lead designer Markus Kossman made my jaw drop many times. That is how smart it is. The second stage of the build is the construction of the gearbox. This one is pretty much in the centre of the truck, somewhat reminding me of the gearbox of a similar set, 2009’s 8285 Crane Truck. This part of the build also gives us the first new elements. There is a new gear rack with a length of 14 studs that is featured in Dark Stone Grey [TLG] / Dark Bluish Grey [BL] (Design ID 18942 | Element ID 6114979) that has both axle holes and round holes. This part fits into a new Bright Red [TLG]/Red [BL] bracket (Design ID 18940 | Element ID 6114965) with a length of 15 studs and a height of 3 studs. These two parts, who only seem to work together, are quite limited in use. The lack of versatility may be an issue, but attached next to each other it provides a very sturdy and compact system of outriggers. The gearbox itself however is not as sophisticated and complex. I am still not sure what I think of the use of the Red 16 tooth gears, since the colour is quite prominent. I would have picked a less bright colour. The gears are mainly situated on one level, but even though the gearbox is not as complicated (that title goes to this year’s 42042 Crawler Crane), it is quite effective. This is also the time to speak about the updated parts of this set. 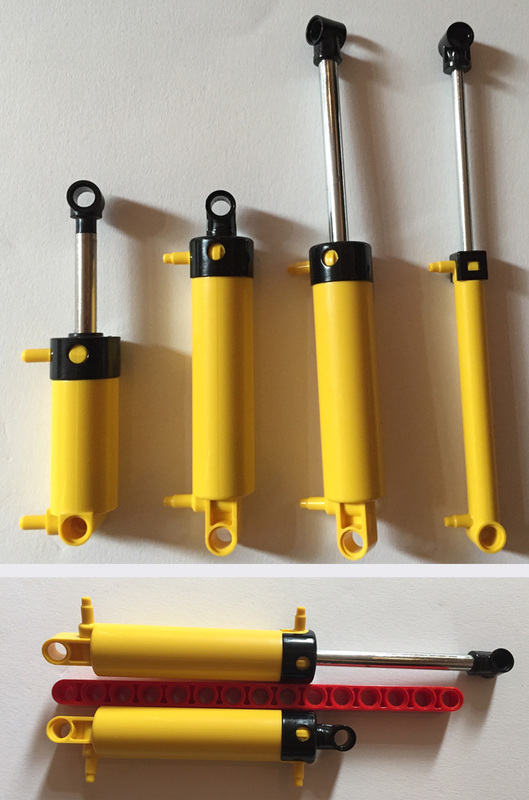 Basically there is a new mould for all of the pneumatic cylinders and valves that we already knew. The compressor pump we find in set 42043 is an updated version of the one we saw in Medium Stone Grey [TLG] / Light Bluish Gray [BL] in sets 8110 Mercedes-Benz Unimog and 42008 Service Truck. This time the pump is featured in Bright Blue [TLG] / Blue [BL], but most importantly the outlets of the pump have been changed. Now it is a lot easier to remove the rubber pneumatic hoses. We see this new type of outlet on all pneumatic parts in this set except for: the T Piece (Design ID 4697) which is a big shame since removing hoses from these is pretty hard, and the Pneumatic Hose Connector with Axle Connector (Design ID 99021). 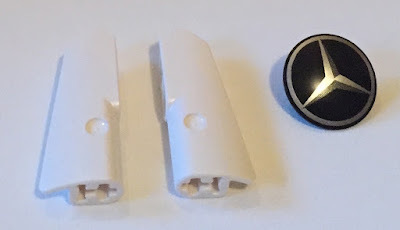 All of these updated parts have a new Design ID, distinguishing them from their previous counterparts. The position of the compressor pump is interesting, since it is completely hidden inside the model. The rear section, which is built with the five bags labelled three, has some new surprises in store. No new parts here, but there are some pretty interesting techniques put into practice. The suspension is the most special part. This is also the section where the linear actuator for the dumping function is added. This is effectuated with standard techniques we have already seen in other sets. But it suffices and that is all that matters. The two components containing the differentials are similar. They are connected by a small turntable, enabling the two axles to swing independently. 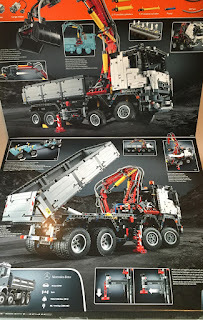 It is a satisfying thought that the designer of this set did not pass up any opportunity to give Technic fans what they eagerly longed for; not only does it have a double set of differentials, but also the rear axles have double wheels. The axle components are then mounted with two 6-stud long links to the rest of the rear section. This causes the lower part of the back to not shift too much to one side once the shock absorbers (this time the version with the soft spring, Design ID 76138) are applied. The whole assembly is then put into place with the use of Steering Arms with Ballsockets and Pins with Towballs. This is an amazing way to create suspension in several directions. Not only can the two axles move independently, the whole truck is now suspended. There is a huge difference between the suspension arrangement of the front and the back. Next up is the most complex section of the whole build. It may look easy at first glance, but building the crane (which uses a lot of hoses) was quite a drag. In a good way though, but making it work smoothly is quite the ordeal. There are so many hoses that I made some errors in the building process. Not in the arrangement of the hoses per se, but it is important to let the hoses run flat to the back of the crane section without installing them too tightly that the air cannot run freely. Since some hoses are just a bit too long there is a lot of extra space used at the bottom of the arrangement, but this arrangement also needs to be attached to the rest of the truck. I really wish the Billund people would have given the young builder some more guidelines on how to attach the hoses. Take a look at the pictures to see which is the best way to make everything work smoothly. I already showed you the massive amount of pneumatic parts you’ll have once you decide to get this set (seriously, do you need more convincing?). Besides a large number of pre-cut (yay!) hoses and the newly moulded compressor pump you also get a total number of four pneumatic cylinders. We’ll get to these in a bit. The parts we already knew, including four valves and a small pneumatic cylinder, also got a new mould with better outlets. The picture show the old version next to the newly moulded ones. This set also introduces some brand new parts. First of all: a much-wanted new turntable. At first sight there don’t seem to be many differences compared to the turntable that has been around for many years. The new turntable is almost the same size as the old one, as seen above, but it is slightly larger, has no inner teeth and the outer teeth (60 in total) are half-bevelled, enabling an angled transmission. The turntable consists of two parts (Design IDs 18938 and 18939 | Element IDs 6109283 and 6109285), which are impossible to separate once clicked together. The way the two halves are joined is similar to the small turntable that is also included in this set. Since the snapping happens at the edges it is much sturdier, and turning the turntable is also much smoother. With the incredible number of hoses here, the use of the old turntable would have been impossible. There would be insufficient space to put them all in. 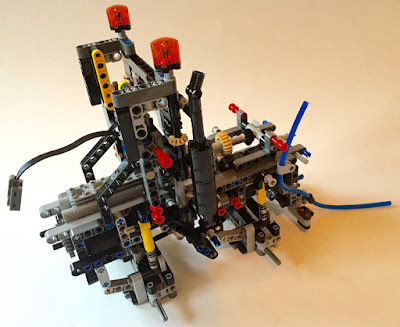 Ever since the pneumatic system with two outlets was introduced in 1989, Technic builders have been asking for longer pneumatic cylinders. When the system was deemed dead some years ago with the introduction of the mechanical linear actuators, all hopes for longer cylinders vanished. Fortunately, the LEGO Group has listened to the fans and finally introduced longer cylinders: a thick one and a thin one. 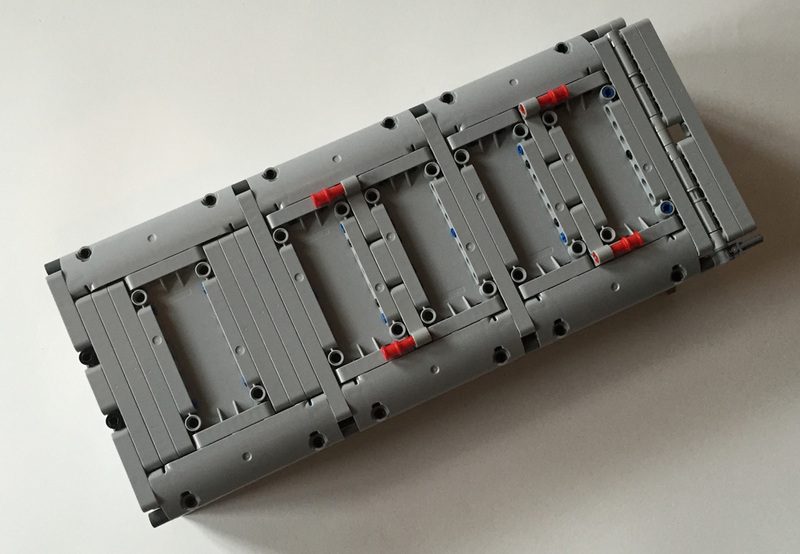 Both have the same length of 11 studs when retracted and of 17 studs when extended. There is not much else to mention about these new parts, except for the base which is no longer two studs wide (a very inconvenient size, since studless building is based on odd lengths), but a comfortable one stud wide. This really makes the mounting of these cylinders a whole lot easier. It does make the cylinder one stud longer, though. I am also happy to see the thin cylinder, that is remarkably steady and strong, has a metal shaft. 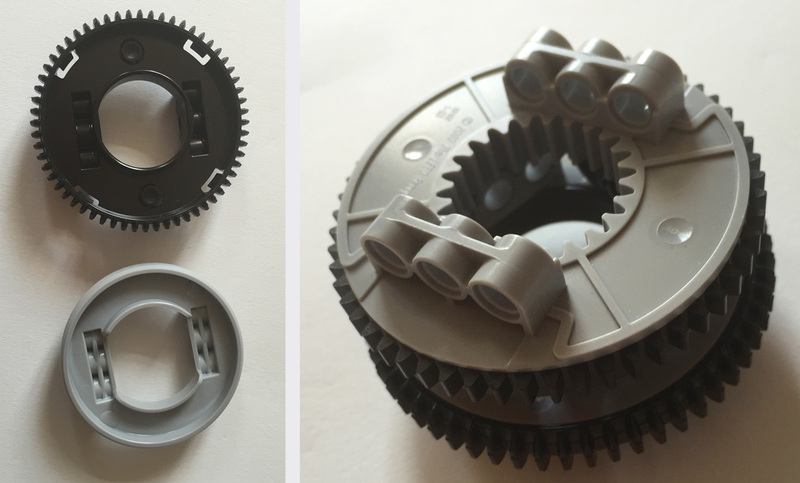 The final new part is a new clamshell (Design ID 18942 18943 | Element ID 6109280), that has dimensions of 7 x 3 x 4 studs and is similar in looks with the other buckets used for Technic machinery. These parts have an axle hole and a round hole for mounting. Once the whole crane assembly is finished, it has to be attached to the rest of the model. It is simply put into place with a ‘Dogbone Beam’ (Liftarm 3 x 5 Perpendicular H-Shape Thick, Design ID 14720) in the cabin and some Pins with Bushes. It may take some pressure to get the crane section securely attached and this also may be a good moment to test all functions to make sure they are not obstructed by the hoses of the crane compartment. What also struck me is the fact the existing Axle and Pin Connector Perpendicular Double Split (Design ID 41678) is now being made from shinier plastic. I found both the old and the new type in my set. Something similar happened last year with the Axle and Pin Connector Perpendicular 3L with Center Pin Hole (Design ID 32184). Maybe this is a sign that the LEGO Group is replacing all connectors with shinier ABS, but I am not sure if I encourage this decision, I kind of like the old versions more. 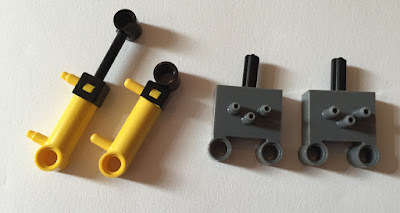 If so, dear LEGO, please leave one very essential part alone; the Axle and Pin Connector Perpendicular (Design ID 6536), because this will drastically change the look of many sets! Once the crane is put into place things look a little bit silly and half-naked. Next up is the cabin. 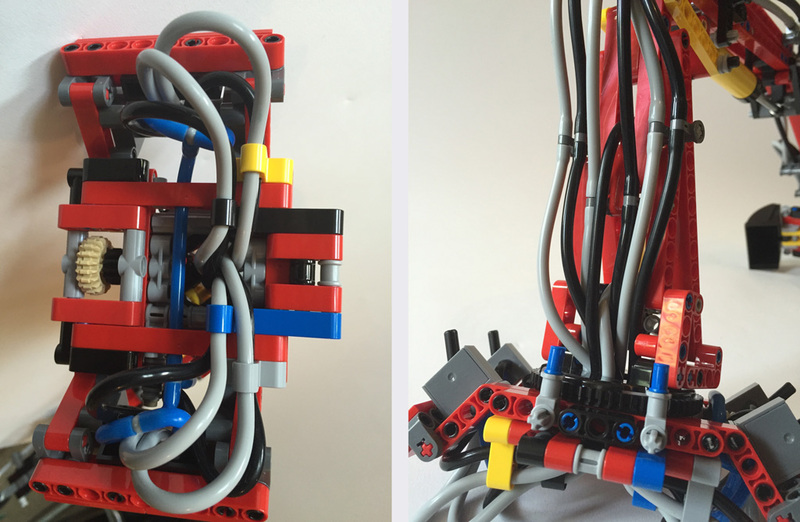 a very enjoyable build that uses the six bags labelled with the number five. I love the fact the build of this Arocs truck now switches from technical parts to the aesthetics of the cabin and the tipping bed. This is also the phase where the last new element is introduced. It is a shield we have seen in other sets and as a minifig accessory but printed with the Mercedes-Benz logo (Design ID 21100 | Element ID 6113039). I am relieved to see that this is not a sticker but an actual print. Well, the LEGO Group did not have much of a choice considering the spherical shape of the surface. The final novelty of this set is the introduction of the small Panel Fairing #22 Very Small Smooth, Side A (Design ID 11947) and Panel Fairing #21 Very Small Smooth, Side B (Design ID 11946) in White. These panels were introduced two years ago and White is the sixth colour they come in. Within the build of the cabin, the most important section is the construction of the grille, which is what makes an Arocs an Arocs. The real-life counterpart of the truck has four rows in its grille, but this LEGO rendition only has three. The bottom row is diagonal but set put securely into place at the backside. It makes use of an impressive number of Pin 1/2 with 2L Bar Extension (Flick Missile - Design ID 61184) by using the stud at one end to put plates on, and the bar at the other end fits tightly inside a regular Technic Pin. You are provided with a staggering amount of thirty of these. I will not go into further details of the build of the cabin, since it is pretty straightforward. It is put into place with several Technic liftarms, enabling the cabin to tilt to reveal the inline motor. The last phase of the building process is the construction of the tipping bed. This is also the moment to let you in on a little confession, which I strongly advise you to heed. The tipping bed is made out of the two bags numbered six and by far the most monotonous and repetitious part of the whole set so I built it first, before starting with the really exciting stuff of bags one to five. Again, there is not much to tell you about this section. You do what you have to do, basically throwing a lot of pins, beams and panels together to create a sturdy tipping bed. A nice touch is the addition of a mechanism to open or lock the tailgate of the bed. This again is illustrative of the eye for detail the designer demonstrates. This utterly amazing set arrived on my doorstep about a month ago, when I was in the midst of writing a review for the outstanding 42040 Fire Plane. Building it, taking over 200 pictures and writing this review took me way longer than I could have possibly imagined, also considering I had other deadlines to meet. The downside is this review was not published before the set arrived in the regular toy stores. On the other hand, the delay gave me some time to let my feelings sink in. My verdict is quite simple: if you can afford it, buy it! There is no way you will possibly regret the purchase. The set is an amazing, varied build (especially if you decide to build the tipping bed first) and the techniques applied are simply mind-blowing. Yes, it is that good! 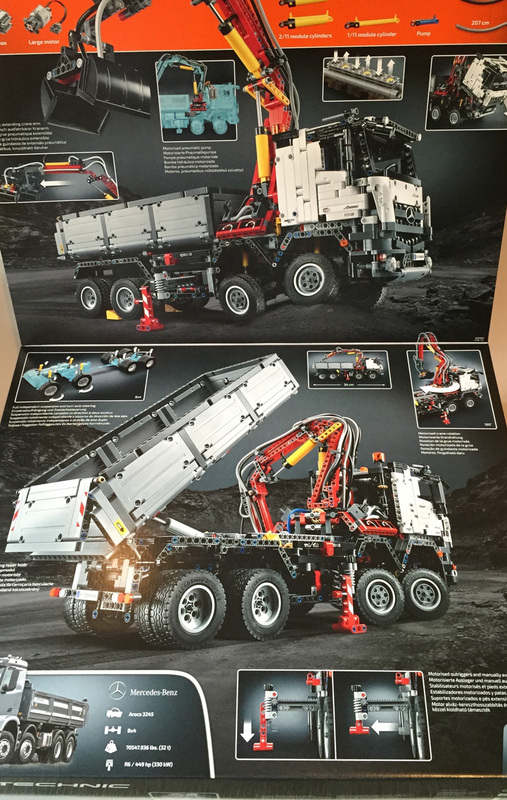 Who would have guessed the LEGO Group would ever release a Technic set this size with full suspension and new longer pneumatic cylinders? In this review I tried to focus on the build, the techniques used and the new parts. There are already many vids on the Tube to show you all of its functions. I did, however, discover one flaw. It may be due to a problem with the bottom cylinder, or the construction itself, but the cylinder had major issues lifting the entire crane arm when the second cylinder was already extended. Also, I once left all cylinders extended when I went out for a few hours, and on return the crane arm had fallen down due to the weight of it all. I tried to discover any potential air leaks but failed to find any. I called the wonderful generous people of TLG who provided this set and e-mailed them a video demonstrating the issue. It is important you let no air escape, by closing the valves you don’t use. I urge to point out to y’all that this issue may be incidental and in no way affects my opinion of this set. It may be one of the most astonishing sets ever produced and I am extremely curious to find out what the wonderful Technic designs can come up with to top this licensed Mercedes-Benz truck. Our thanks to LEGO Group's CEE Team for providing this amazing set. This set is available now. Consider using our affiliate links to buy it (or anything); this helps support New Elementary! Bought it yesterday, so happy to see it's as much fun as it looks. I think I made some children in the shop cry when I picked it up ! There area unit several blessings of victimization air tools, conjointly understand as gas tools, in producing environments. Let's take a glance at a couple of of the explanations on why air hopped-up tools area unit thus standard. Cost. they need less moving elements. Less elements suggests that lower value. you'll be able to conjointly ordinarily obtain a a lot of powerful air tool, than you'll be able to an electrical tool, for identical value. And with fewer moving elements, they're going to ordinarily last longer. This longer life saves cash on replacement prices.